The exterior of your house often creates the first impression about the rest of your home to neighbors and visitors alike. If you are considering a home exterior design project, your first goal should be to create a relaxing, yet functional environment. So how do you get started? The process for developing an outdoor “room” is essentially the same as when you remodel an indoor space. While you may need to consider some special circumstances, such as privacy or shelter from the elements, you want to carefully plan for factors including space optimization, architectural style, color themes, traffic flow, and comfort. If you are in the early stages of an exterior remodeling project, it is essential to know what you want. Consider your neighborhood and know why you are remodeling. For example, are you going to be remodeling to enhance resale value, or do you want to remodel to enjoy your outdoor space for years to come? 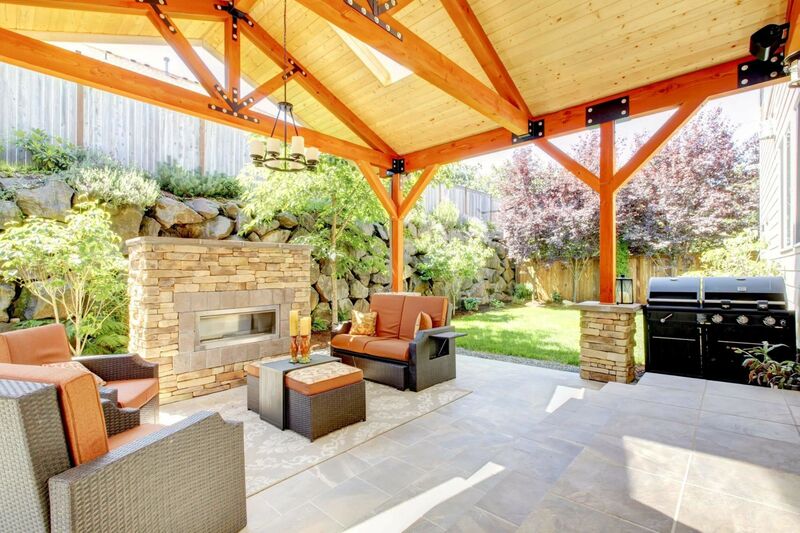 Also, similar to any other remodeling project, it is essential to create your budget for your outdoor space before signing on the dotted line with any remodeling companies. This part of the process is critical to determine how much you can afford. For example, at Republic West Remodeling, we always work with homeowners to develop an elegant, functional design that works around your needs, regardless of your budget or space parameters. By knowing the size and layout of the area you want to remodel in advance, you can better plan for the “zones” you want to create. For instance, you can accommodate relaxing, entertaining, cooking, or even sports-related activities in separate areas to allow for efficient traffic flow. Furthermore, we encourage you to think about the impact of the elements in these designated spots, such as sun and wind. Furniture placement in your outdoor living space is also vital; it is important to think about how these spaces will be used by you and your guests. Any outdoor area should feature at least three seating options, along with coffee and side tables. To separate your outdoor areas, try incorporating interesting elements such as trellises, landscaping, or planters. These features exude a natural, outdoorsy feel, adding texture, pops of color, and visual appeal to your space. The goal with an outdoor remodeling project is to make it appear like a natural extension of your home, with a seamless flow from inside to outside. Consider complementing or matching interior colors and patterns outside, and integrate a design theme that blends well with your home’s current indoor style. Consider the view from your outdoor space, including living rooms, family rooms, and bedrooms. You can enhance any room’s view by adding soothing water features, unique landscaping, and other elements. Keep in mind, it is important to make sure you have an appropriate level of privacy. Many homeowners opt to add walls, fences, trees or other stylish elements to block out noise during the remodeling process. You can also add features, like awnings, gazebos, and pergolas to enhance privacy and protect you from elements like sun, rain and wind. Adding outdoor lighting is a smart approach if you want to emphasize exterior design elements. It also offers function, sophistication, and style. There are countless options when it comes to outside lighting. Many homeowners choose to brighten up doorways, paths and walkways, entertainment areas, like outdoor kitchens, pools, patio and deck lighting, as well as other gathering places. The key to outdoor lighting is to realize that, like any other lighting for your home, there are different types of fixtures that serve different purposes. Some lights are used to brighten up walkways, while others serve as accent lighting. Creating a new outdoor living space in Arizona can add tremendous enjoyment to your home. At Republic West Remodeling, we encourage clients to walk around their “ideas” before forging ahead with outdoor remodeling plans. What does this mean? Once you determine the intended use of your exterior space, consider the layout by walking around to see how smoothly and seamlessly you move through it. For instance, if want to design a quiet reading area, how will you get there from your nearest entry? Or, if you plan to spend your evenings dining out under the night sky, yet you do not want to build an outside kitchen, be sure you design a clear, easy-to-navigate path from your house to the seating area. Are you ready to transform your home’s exterior into an outdoor dream space? Contact us today for the highest quality, luxury outdoor remodeling services. We serve Phoenix, Scottsdale, and the surrounding communities. Call (480) 719-1245 to schedule your complimentary home exterior design consultation.